A complimentary Southern breakfast an outdoor pool and rooms with microwaves and mini-fridges make the Best Western Hammond Inn & Suites one of the area's most popular hotels among our guests. The two-story Best Western offers 63 rooms with microwaves refrigerators and coffeemakers. Stay entertained in the comfort of your room with free Wi-Fi access and cable TV with several HBO channels. Be sure to take advantage of the free Southern-style breakfast before you hit the road. The outdoor pool is a refreshing way to wind down at the end of the day or you can head to the fitness room to burn off that free breakfast. Copy and fax services are available. Pets are permitted for an additional fee. Parking is free and so are local calls. Non-smoking rooms are available. The hotel is off I-12 next to the popular restaurants and stores at Hammond Square Shopping Center. 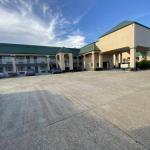 The hotel is two miles south of downtown Hammond and Southeastern Louisiana University. Kleibert's Alligator and Turtle Farm three miles away is one of the area's most popular attractions. You can reach the Big Easy also known as New Orleans in one hour. The hotel is 36 miles from Louis Armstrong New Orleans International Airport.